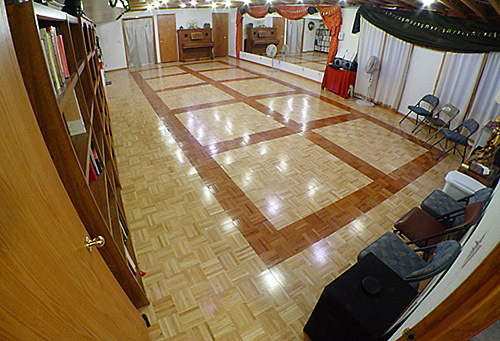 Most classes are taught in the dance studio in Dave Arns' home, at 813 Marshall Street in Fort Collins, Colorado. For directions on how to get there, see the Map page. When public classes are scheduled, there will be a sign on the front door saying "Dancers come on in!" so when the sign is up, you do not need to ring the doorbell; just walk right in. When you come in, just follow the signs to the studio (or follow your ears to the music). At public classes in Dancer Guy's studio, we open and close each class with a short Christian prayer, and you are invited (but certainly not obligated) to participate. Please don't feel awkward if you prefer not to join us during the prayer; we'll be done in a moment. The studio is a large, well-lit, air-conditioned room with a wood floor, mirrors on two walls, and a substantial sound system. I hope to see you in class there some time soon! *If paying electronically, a $2 processing fee will be added. Offsite Events | Onsite Events | Weddings | Gift Certificates | Physics | Links | Instructors | Contact Us | Sign Me Up! All content © Copyright 1999-2019 Dancer Guy, LLC. All rights reserved.